Okay that should work. The,first command was a duplicate anyway. Try to restart and see what happens. I don’t understand why you cannot access your drives in command prompt though? Edited by dmccoy, 28 January 2018 - 04:24 PM. Did you change the boot order in the bios to the correct C: drive? Run the bcdedit again and provide a picture. I'm not sure what you mean by "correct C: drive". I havent changed anything in the BIOS. I removed the Win 7 installation disk and rebooted. The screen showed "Starting Windows" with multicolored dots that swirl in to form the Windows logo. However it freezes on that screen and then reboots itself and then gives the message saying "Windows did not start correctly......"
What bcdedit command do you want me to run? Please run the this command bcdedit > 0 & notepad 0 and provide the output file or picture again. 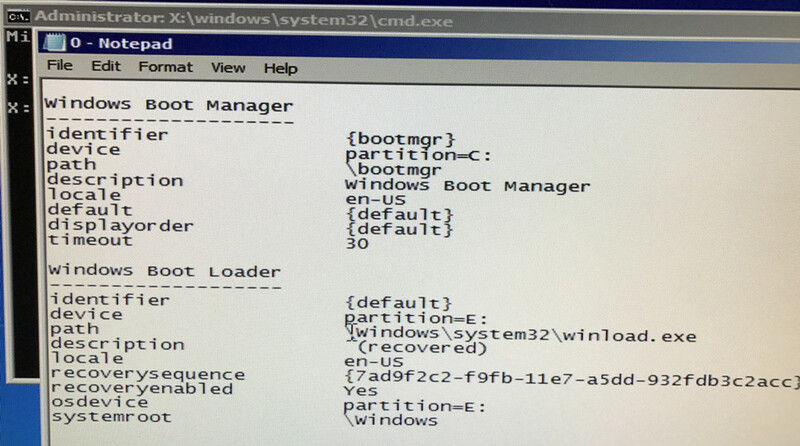 Then you may have to rebuild the boot file once C drive is working and active. Edited by dmccoy, 28 January 2018 - 05:32 PM. I ran the commands again and again they ran successfully. I then ran the bcdedit > 0 & notepad 0 command again and verified that it changed the bootloader location. However when I reboot the system does not save the changes, it fails to boot and when I run the bcdedit command again the bootloader location reverts back to the E: drive. I had already tried using diskpart to manually assign the drive letters before I made this forum post. Just like above, it will show me that it has manually reassigned the drive letters to what I need them to be while I am in the Win 7 Recovery Environment but as soon as I reboot the system reassigns the incorrect drive letters. It seems any changes made in the recovery environment don't stick. When I recovered the RAID array composed of the 4 spinning drives I ran a live system rescue disk to do that. I used the TestDisk software and it rebuilt the partition successfully. That did stick. I believe I can delete the partition which is now labeled C: using TestDisk. Should I try that? I think it is all regarding your raid array which is causing the difficulty. You don’t want to remove the system Reserve partition it is required and should be the first partition. I am not familiar enough with raid to feel I can offer you the best assistance. However, my last idea would be to use a disk partition program such as minitool or other and see if you can assign the correct drive letters and move the partitions to the correct locations. Maybe someone else with have some other ideas as well. Okay thank you very much for your help! You’re welcome sorry you didn’t have better results. Let us know if you figure it out or can do anything else. I was thinking about this again today and I think i was looking at it wrong last night. We want to move or create your boot files on your drive listed as E since it has Windows installed. Have you tried that option? If not run the following command to change and see if it will boot. Next option, if you haven’t tried already. Only connect the two raid drives and make sure the hard drive listed as E is on Sata 0 so it is the default and should be listed as C: then see if it will boot or you can at least access from command line. I don't think running that command will do any good since nothing I do in the recovery environment command prompt seems to stick when I reboot. Someone else also suggested to me to connect only the two SSD RAID drives so I will try that and let you know. Thank you for perservering! Yeah until we can get One of your drives to show with command prompt it probably useless. Let me know what you find out with the other option.